The year 2013 is headed to a strong start as a year of comets. There are already two bright comets visible without optical aid with a third on its way for the end of the year. C/2011 L4 was discovered all the way back in June of 2011 by the Pan-STARRS team in Hawaii. The comet was originally on track to be magnitude -1 this month, but its brightening trend slowed during January and the comet is now 3 magnitudes behind, expected to reach a maximum brightness of just magnitude 2. Even so, the comet has already grown an impressive set of tails as it edges ever-closer towards perihelion on March 10th. The comet has been visibly only from the Southern Hemisphere the past few weeks. 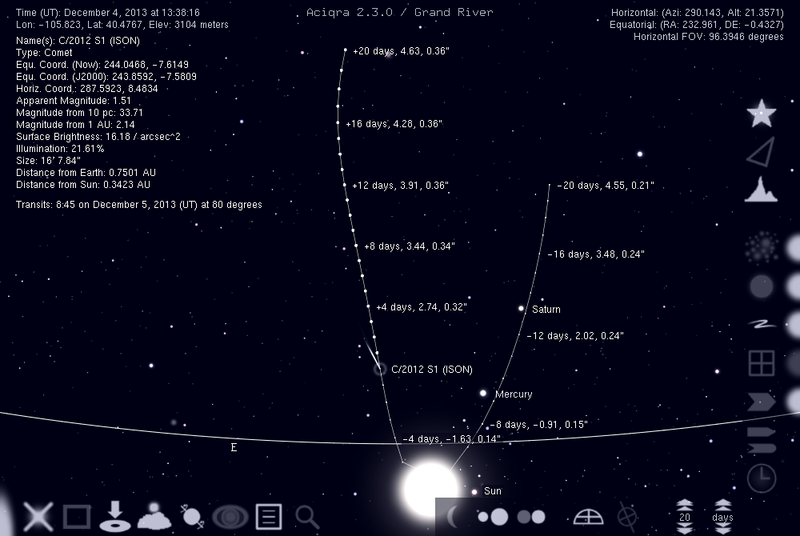 Over the course of the next few days, C/2011 L4 will move north of the Sun and become visible at northern latitudes following perihelion. The comet will be visible immediately after sunset to the west, hovering a few degrees over the horizon at dusk. C/2012 F6 was discovered by the team at the Catalina Sky Survey on Mount Lemmon in Arizona. The comet has been, and will continue to be a southern object over the next month as it glides through perihelion on March 24 before moving north of the Sun in April. Originally expected to reach magnitude 6, C/2012 F6 exceeded all expectations as it exploded in brightness and is now on track to reach magnitude 4.5 later this month. In contrast to PANSTARRS, Lemmon has very little dust compared to gas. The high relative abundance of gas, specifically molecular C2, tints the comet a distinctive green. C/2012 S1 was discovered late last year at the International Scientific Optical observation Network (ISON) and is anticipated to be a brilliant sungrazer this November -- if it survives perihelion. Current estimates give the comet an absolute magnitude about 6.7 which suggests that the comet is relatively small and may break apart upon experiencing the intense heating at 0.01 AU from the Sun. Assuming it survives intact and the current rate of brightening continues, the comet could become a daylight object, reaching negative magnitudes much as C/2006 P1 (McNaught) famously did in 2007. This time, however, the comet will be visible primarily in the Northern hemisphere, both before and after perihelion. 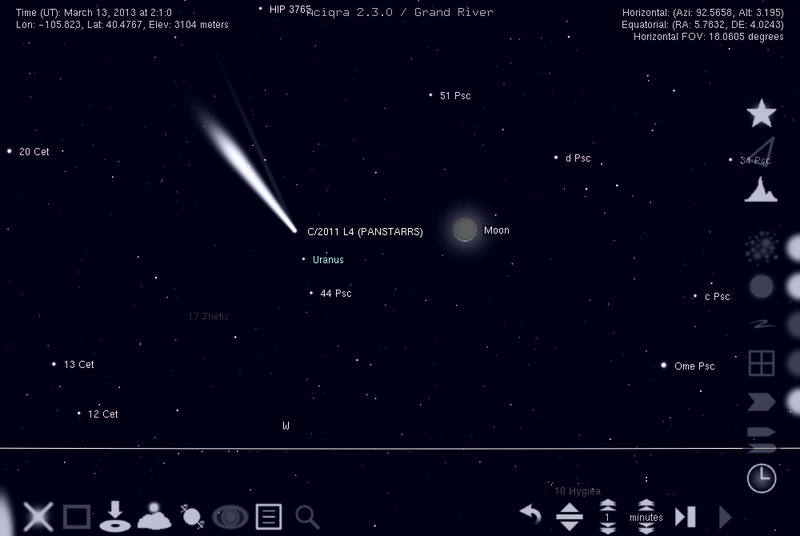 The Southern hemisphere may have a fleeting view of the comet on November 28 as it passes through perihelion. However, the comet quickly returns north of the Sun afterwards.